I've not been in Phuket for the last few days. I am told that it's been mostly sunny, but the west winds have started to blow - this means waves on the beaches and waves out at sea. The last few liveaboard dive trips to the Similan Islands (100km from Phuket) have been cancelled, even with sunny skies! Anyways, we've been away for a few days. 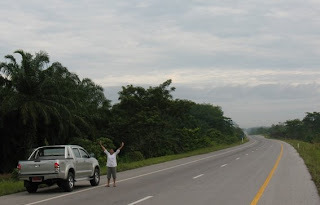 We drove from Phuket to Chumphon on Thursday 1st May, about 400km. Chumphon is on the east coast of Thailand. Weather was pretty much the same as the west coast - some sun, some rain. At this time of year when seasons are changing, you get a mixed bag all over. Normally we are rather lazy when we visit my wife's family in Chumphon, but this time we decided to do some exploring. 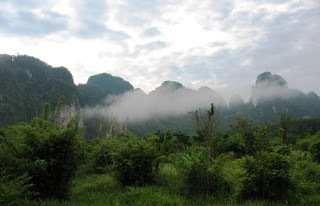 We drove up further north to Prachuap Khiri Khan on Friday, via Ban Krut. 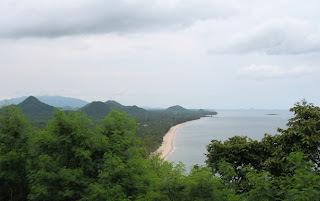 We'd hoped to stay at Ban Krut but the beach did not look so great and the hotels were asking silly prices. 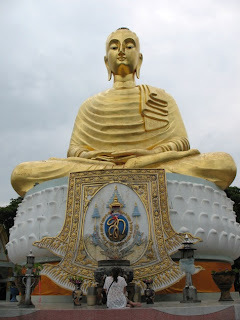 We did stop at the huge Wat Tang Sai temple, which is on a hill overlooking Ban Krut. An amazing temple! We half thought to drive back to Chumphon, but were rather tired. We checked accommodation at Ao Manao, just on the edge of Prachuap Khiri Khan town - seaview rooms for 900 Baht, but fully booked. We visited my wife's cousin in town and there was a small hotel just a few meters from her house with decent rooms for 650 Baht (Prachuab Place Hotel - www.prachuabplace.net). We took a drive down the the seafront. 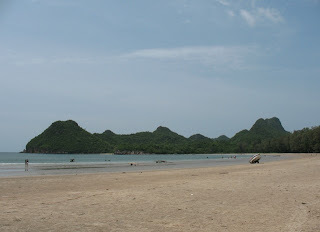 Prachuap Khiri Khan is a small town right on the ocean. I liked it. 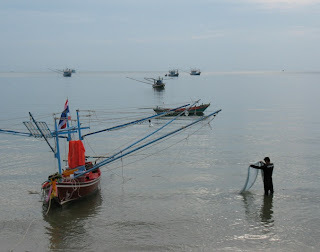 In the morning I took a walk along the seafront where fishermen were bringing in the night's catch of fish and squid. Weather was decent, looked like a sunny day on the way. We went to Ao Manao again, the sun was shining and we had an early lunch before heading back to Chumphon.